It’s time for this mad, one-eyed Geelong supporter to make a bold prediction: Richmond can win the 2017 premiership. In fact, it’s not even a bold prediction. After thirteen weeks, it could be argued that they have made a compelling case for premiership contention. Round 7: Western Bulldogs 11.14.80 def. Richmond 11.9.75. This game could have gone either way. 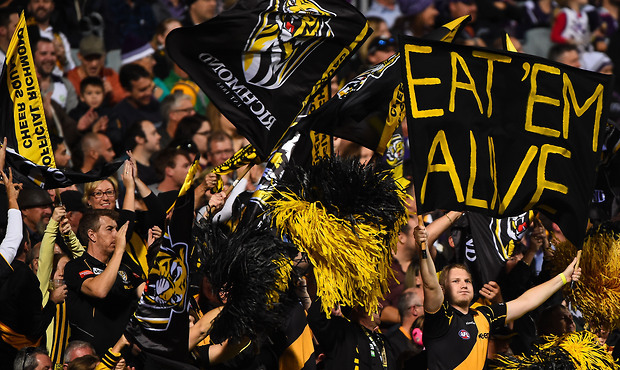 Richmond did squander a 33 point advantage, however, much to the frustration of Tigers fans who would soon find this scenario to be all too familiar. Richmond came charging back from a 5 goal deficit at 3qtr time to hit the front with seconds left. Their joy was short lived, with David Mundy goaling after the siren. Richmond again enjoyed a five goal advantage before Greater Western Sydney narrowly triumphed on their home turf, with Jeremy Cameron kicking the winning major with seconds left on the clock. Agonisingly, they (again) surrendered a five goal advantage for the third time this season to go down against last year’s grand finalists. Apart from the obvious issue of squandering leads, Richmond has consistently played good, competitive football against quality opposition. Compared to the clubs ahead of them on the ladder: Adelaide, GWS, Geelong, Melbourne – Richmond can rightly claim to have performed to a consistently higher standard than all of them from week to week. GWS has suffered three significant losses, Geelong’s inconsistency continues to plague them, and Adelaide was significantly beaten by Melbourne, Geelong and North Melbourne, not to mention last week’s shock loss to Hawthorn. Geelong could easily be 6-7 after thirteen rounds, but they have managed to win three games by less than a kick. Meanwhile, Richmond could be 12-1. They also boast of the second lowest points against this season: 1016, second only to Port Adelaide. The only time they have had 100 points scored against them was against Adelaide in Round 6. Rance and Astbury are both enjoying All Australian seasons. Meanwhile, Champion data shows that Motchin (Dustin Martin and Trent Cotchin) are currently outperforming every midfield duo in the league. Richmond are number one for defensive forward pressure, and they are number two for marks inside 50, second only to Adelaide. In the nine rounds left, Richmond only play two teams in the top four: Port Adelaide and Geelong. It is likely they will win the majority of those nine games. With a probable top 4 finish, Richmond can do genuine damage this September. They are playing confident, attacking football and the workrate is more widespread than previous seasons. There is no reason for Tigers fans to be pessimistic about their club’s chances of silverware this year.